New hardbound study scores based on the musical text in the Haydn Complete Edition. Each volume contains a preface in three languages reflecting the latest in scholarly research and a critical report with key information concerning the sources and textual criticism. 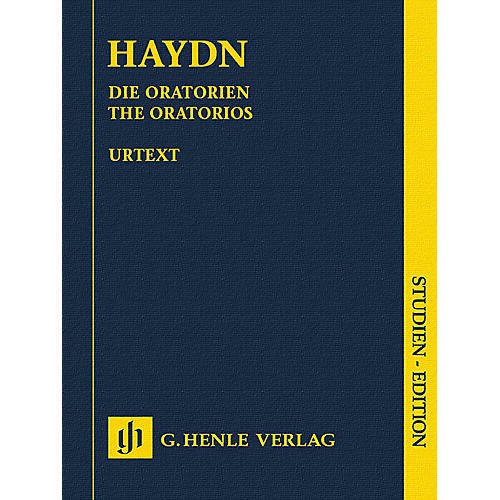 In honor of the bicentenary of Joseph Hayden's death, Henle published these very affordable study scores of all of his oratorios, following the musical text in the Haydn Complete Edition, but have also collected them together in a slipcase. Aside from the musical text, each volume contains a preface in three languages reflecting the latest in scholarly research and a critical report with key information concerning the sources and textual criticism. These study editions are a feast for the eyes and have been produced with long-term use in mind. All in all a total of almost 2,000 pages of Henle Urtext filled with oratorio artistry - Henle's gift to the world of music!